Take nearly 40 years of guitar playing experience, add in that same amount of time repairing and building guitars, flavour with a dash of modern technology and bake gently with a lifelong passion. That is the Chris George recipe for creating unique custom instruments. When Guitarist Magazine in the UK awards its coveted 5 star "Guitarist Choice" you know this is something special. When that same magazine features the builder again under its "Best Gear First" byline then there can be no doubt - this is the premier level of guitar design and construction. Chris George Guitars are special. If now is the time to create the guitar you have always wanted then embark on that journey with a master builder - and realise your dream. 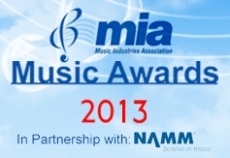 Chris was shortlisted for the 2013 'Best Acoustic Guitar of the Year' MIA award. The only independent maker to be represented. 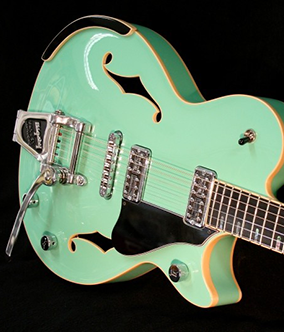 Our aim is to make each Chris George guitar unique and special to the owner. Each guitar should take on it's own identity; whether it be an acoustic archtop or electric resonator - or any point in between! There is no production line and there is no batch building. 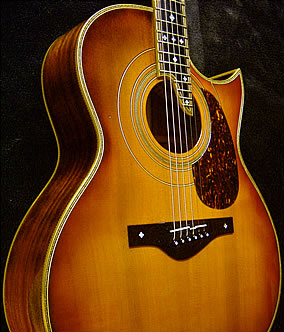 Every guitar is focused on individually for the customer. Each guitar may be loved and cherished but above all it is made to be played and played. If you would like to discuss your own custom build then please contact us by by phone or e-mail and, of course, you are very welcome to visit us to explore details and options in greater depth. There can be up to a six month waiting list but this does vary. Allow about 6 weeks for your guitar to be built from the time we start the build. Prices start from £1800 but vary dependent upon the options that you choose. Different players demand different guitars, big bold brash strummers, delicate pickers, earthy slide players or the mellowness of nylon strings. The electric guitar is a modern design icon and a custom build is your chance to blend all the designs and features that you have ever wanted to create your perfect instrument. These are dedicated electros - rather than acoustic with pick ups. They are designed to be played plugged in, often in a band situation (and as we all know drummers can't turn down). However they may be softly noodled whilst watching television and they don't annoy the dog too much. 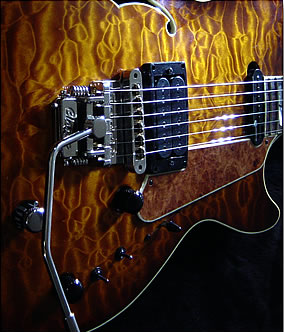 Chris George Guitars is one of the leading exponents of combining digital modelling technology with beautiful custom builds, with or without magnetic pickups. "I discovered Chris George when he sent me a photo of one of his superb instruments. We had both been experimenting with Line 6's Variax technology and had both concluded that the technology was superior to the guitar it came with! Chris had loaded Variax guts into what, when I actually got to see it, was a simply superb instrument. I subsequently commissioned an instrument from Chris and when I went to pick up the guitar my initial faith was confirmed - another superbly made six-string. But what impressed me most was the fact that he built exactly what I wanted. Too many custom builders build you what they want. Not Chris. From the finish, the neck shape, the tuners, the fretwire. it all was spot on to my specification. But a specification list doesn't make a great guitar. Chris took these ingredients and turned them into something far greater. I honestly believe his own single-cutaway outline is up there with modern designs like PRS's Singlecut; his top-carving could grace a fine violin and his attention to detail is on par with the finest 'boutique' makers of today. A second Variax loaded custom-order followed and again the work and interpretation was flawless. Both instruments have been extensively used and have received nothing but praise from other players. Both are working instruments not museum pieces. Here is a British custom guitar maker that understands the art but most importantly understands the needs and desires of his customers. I look forward to working with Chris on another guitar." 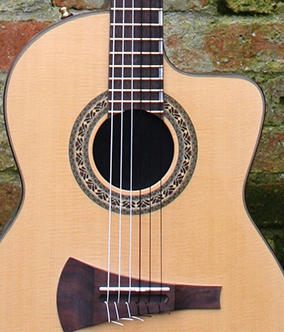 2004 "George is up there with the best"
2006 "Aside from being a wonderful player (The guitar not person Ed ) the heel joint is especially impressive"
2008 "In short Here's a British maker who really delivers"
2012"As one of the UK's finest custom makers"
2013"Here's a guitar that proves that not all innovation comes from major brands-A beautiful instrument"
2015 "Clearly, it isn't just the Yanks who can turn out a cool "bashed about" looking axe. It's time to look closer to home we reckon." 2015 "It's a beautiful lightweight, very manageable guitar (7 string fan fretted acoustic- Ed )-the low string easily drops down to A, overall there's rich, complex resonance"
2017 "Chris's build and attention to the smallest details puts his work up amongst the best there is in the world"